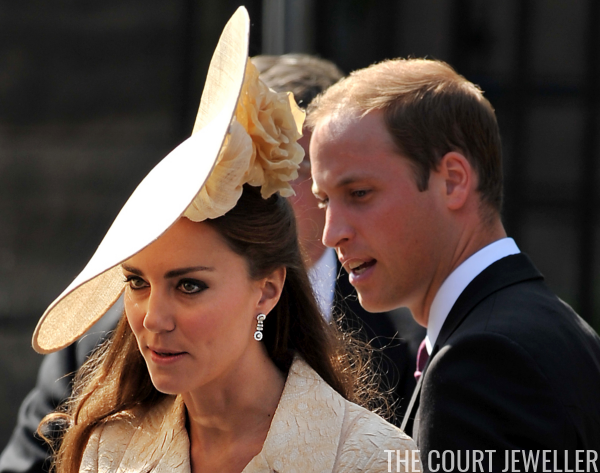 One of the most versatile sets of gala jewelry in the Duchess of Cambridge's collection is a suite of diamond jewelry made of clusters and baguettes. Here's a closer look at both of the pieces from the set. The earrings feature two diamond clusters bridged by three horizontal diamond baguettes. The bracelet has a repeating diamond cluster and baguette pattern bordered by two rows of diamonds. The central diamond of each cluster has a distinct yellow hue. It's possible that the set also includes a ring. 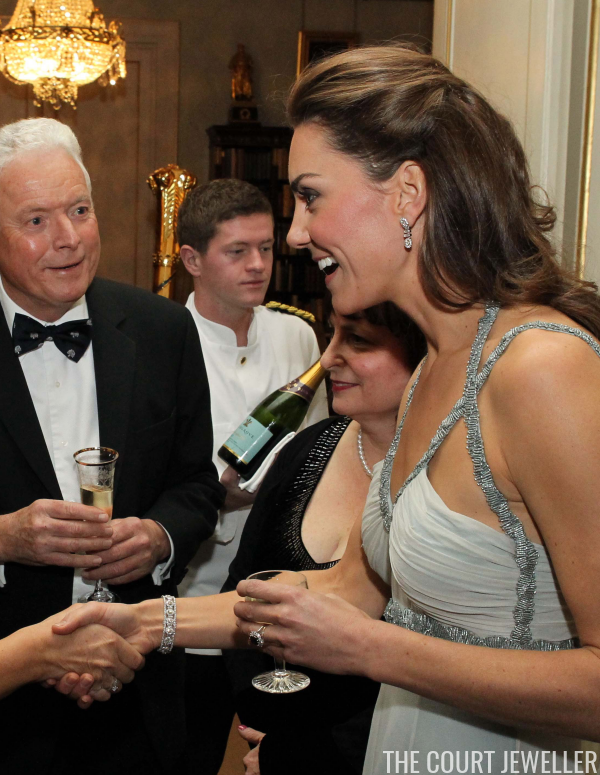 In October 2013, Kate wore a double diamond cluster ring on her right hand at a gala event; she also wore the bracelet from the cluster and baguette suite. The set is often said to have been a wedding gift from Prince Charles, though I'm not sure precisely where those rumors started. To my knowledge, the provenance of the set has never been confirmed. 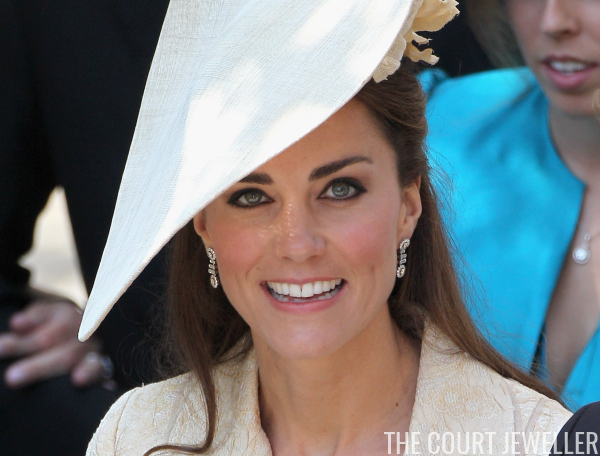 Kate began wearing the earrings shortly after her wedding. She debuted them in Ottawa during the Canadian tour in the summer of 2011, pairing them with the Queen's diamond maple leaf brooch. Later in the same tour, Kate debuted the matching bracelet. She wore the piece with the Queen's diamond chandelier earrings during the BAFTA Brits to Watch event in Los Angeles. 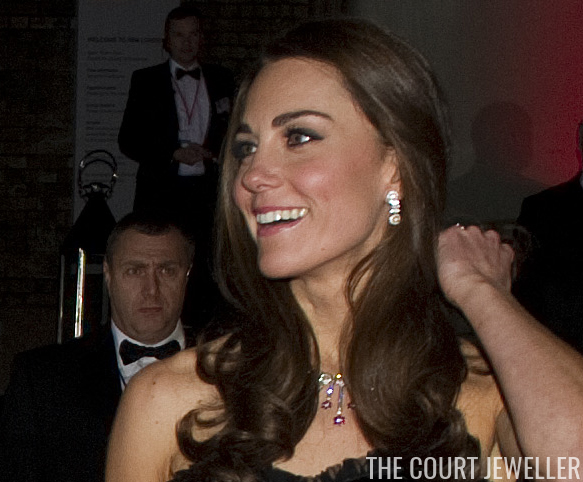 Kate has also worn the earrings with other jewels. At the Sun Military Awards in 2011, Kate wore the diamond cluster and baguette earrings with her Mouawad ruby and diamond demi-parure. 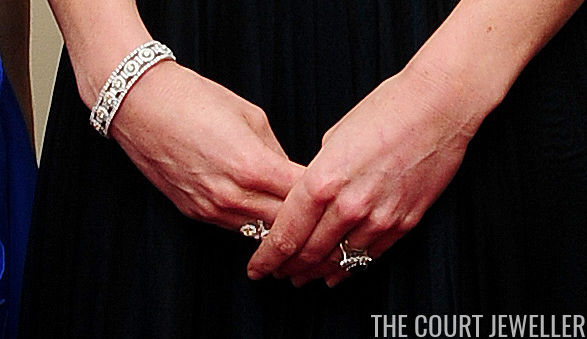 Kate's worn the earrings and bracelet from the suite both together and separately many times in the years since her wedding. Above, she wears the earrings (plus her infamous potato chip hat) at the 2011 wedding of Zara Phillips. She wore the earrings and bracelet together in October 2011 at her first solo engagement, a reception for In Kind Direct at Clarence House. Appropriately, if these pieces are indeed gifts from Prince Charles, she was standing in for her father-in-law at the event. Kate has also taken the pieces with her on other royal tours. 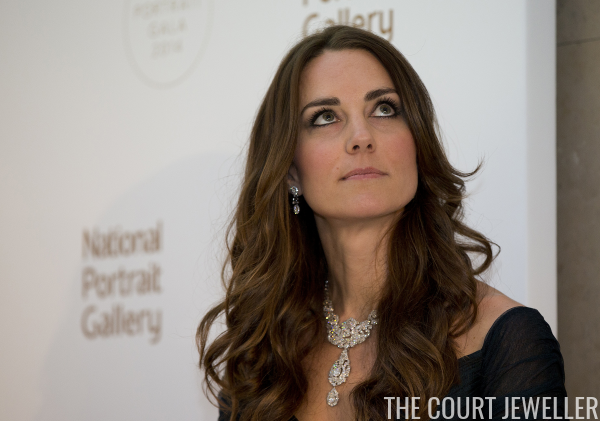 Above, she wears the earrings and bracelet at Canberra House during the 2014 tour of Australia and New Zealand. ...and the earrings with the Queen's Nizam of Hyderabad Necklace in 2014. The relative simplicity of the suite's classic design makes it compatible with a whole range of other jewels, and I imagine we'll see her wearing both the bracelet and earrings for quite a long time.